The first cut is usually a sign that the seasons have officially changed. It means that the long dreary winter is finally over, and the rebirth of spring has arrived. This year, just as the seasons are changing, so is the neighborhood. My neighbor and great friend Joe passed away last October. He hated cutting the grass. Despised it actually. He didn’t do a very good job when he cut it either. His blades were never sharpened and there were always clumps and clumps of grass because he waited till it was a forest before he cut it. It was a shame too because he had such thick green grass in the backyard. So I took it upon myself to make his lawn my responsibility. Partly because I wanted to help, partly because I hated looking at his un-kept lawn, and partly because I love cutting the grass and my yard is too small. The funny thing was that it would take him a good month before he even realized I had cut the grass. “Did you cut the grass! ?”he’d ask all surprised after he finally looked out his back window. Like I said, he hated it, so it wasn’t a priority for him. That month of cutting turned into a few years. It was nice though. I was helping out a friend and it gave me more grass to cut since my yard was so small. More grass, meant more time behind the mower with headphones on alone with my thoughts. Alone time I thoroughly enjoyed. But unfortunately things are different this year and my work load will be a little lighter than usual. Joe’s house sold and we will soon have new neighbors. It’s one of those things that needs to happen and will be a good thing. I know this. But even though Joe’s house sat vacant all winter, it still felt like his house still. And now after walking through the freshly carpeted floors and seeing the freshly painted walls of his house, it clearly isn’t his anymore. All the character and charm of him and his wife’s personalities are packed up, sold off, donated, or thrown away. It’s just a house now. I cut Joe’s grass for what would be the last time on Sunday. I paced the yard back and forth taking care in making my lines straight. I would look back at the house and think about all the good times we had. Cutting his grass was the last physical connection I had to him. Just as the first cut of the season is a sign of spring and saying hello to a new season, it’s also about saying goodbye to another. I welcome spring with the new buds on the trees and the green grass, and am ready to say goodbye to winter. Goodbye to the cold dreary days. Goodbye to my neighbor. Goodbye to my friend. But just as it is with winter, it’s not goodbye, it’s more like see you later. This had to be one of my favorite reads from your site. Thank you for sharing it. too bad twas your first time i been cutting for six weeks and twice a week !!! i wonder who likes it best ??? This was a great read Matt! I too enjoy mowing the yard (though I despise edging), though right now yard service is included in the rent so I haven’t done it in 2 years. There’s something about it that’s so calming. All you have is the mower and your thoughts/songs. It’s meditative. Sorry you lost your final connection to your friend, but as you said, it’s just a “see you later”, as well as a chance to connect with a new set of people. Two years is a long time to go without cutting the grass. 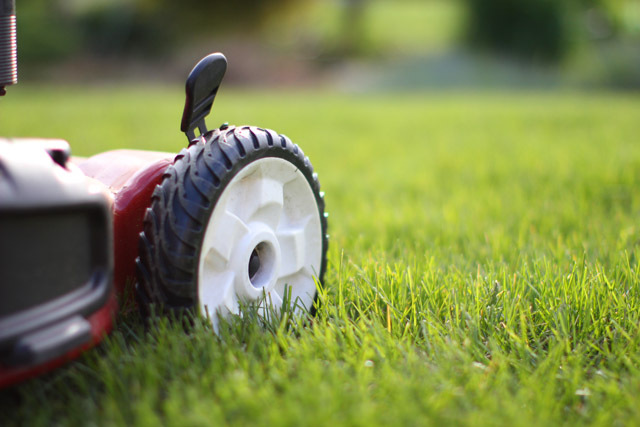 Hopefully you can get behind a mower soon.